Last day to sign up for the spring Ambrose Farm CSA is Sunday! Be sure to have plenty of farm fresh vegetables to go with your Cordray Farms Beef! Sign up by clicking on the link below. Pete's taking just a few more members. Phillip Runyon picks up his mount from Cordray's Taxidermy! And don't you dare move! Goats and other grazing animals, like deer and cattle, will often tuck their babies in a secluded area and leave them while they go off to graze. 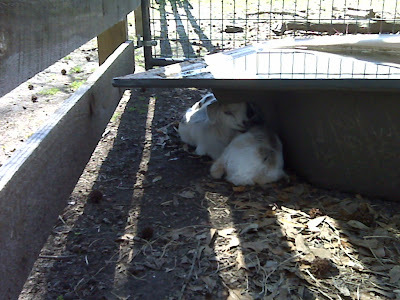 These three little ones are hidden by the water trough to await mom's return. The babies will stay there for hours without moving at all. The camera noise made one of these lift his head, but the rest stayed absolutely still. 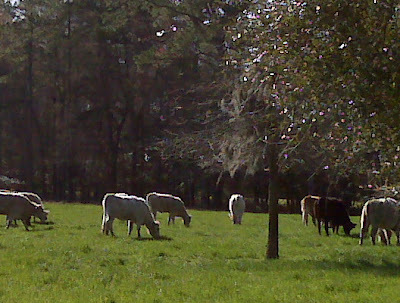 When the herd returns, they'll be hopping and running all over the place! I'm not sure what she tells them, but they sure do listen! I hope this email finds you enjoying the FINALLY warming weather! If you've been watching the Cordray's blog, you know that we've been struggling with all this cold wet weather! For weeks we've only been able to get into some fields on the tractor! That's why I'm contacting you today. We'd promised to have beef ready about 2 weeks ago and they are not ready yet. This kind of weather slows up the growth of the new spring grass and the cattle just don't fatten up on hay! So it will be at least 3 to 4 weeks before we have steers ready for harvest. When we do, we expect to have 2 steers or 16 shares ready that first time. I'm encouraging folks to go ahead and send in their deposit to reserve your shares now. Usually we do a round of shares, then a round of sides, but we can have sides ready this first time if you let us know early enough. If you're an old friend, you can skip this next part. :) We've had a lot of new folks join and I want to be sure to give you all the information you'll need to decide what will work best for your family. Right now in March, we don't keep regular hours, but are glad to meet you here to pick up your beef by appointment. We're also considering making deliveries if we have folks who order shares or sides and live in the same area. For instance, if several neighbors in Mt. P order shares, we could deliver them to your neighborhood. Cordray Farms Beef Sides - This is a half cow. It is custom cut to your exact order. You can come in and oversee the cutting or just let Michael walk you through it on the phone. You'll get individually vacuum sealed steaks, the cuts of your choice, and burger in patties or bulk. If you're familiar with our venison boxes, it fills about 6 boxes, so you'll need a good sized freezer. There's obviously only 2 sides per steer, so be sure to send in your $200 check early to reserve a side. Cordray Farms Beef Shares - These are our CSA shares. We take a steer and cut it into the standard cuts (steaks about 3/4 inch thick) and burger. Then we divide the whole animal into 8 equal - or pretty close - shares. You and 7 other families get to share the bounty from one animal! It's cow pooling! We ask that you send in a $100 check to reserve your 1/8th share. It will fit in a regular refrigerator freezer if you don't have too many frozen pizzas! Thank you for your patience. Lots of farmers can have beef ready earlier by loading them down with corn and hormones, but real old fashioned natural beef takes time! I promise it will be worth the wait! As anyone who knows me will tell you I'm NOT a morning person. But Sunday morning I took in a show that I highly recommend. When's the last time you saw the sunrise? Now it doesn't count if you regularly see it over the hood of your car or if its steady climb in the sky just means you're getting later and later for work or your list of to-dos! No, I mean really saw the whole sunrise, just for the heckuvit? I bundled up, coffee in hand to experience the sunrise on this early spring Sunday. It was a show with the soundtrack symphony of roosters competing with an owl for center stage. It had drama! It was dark. My hair was tucked under a camo duck hunting cap. I ambled around the corner of the house and our country burglar alarm came boiling out the doghouse and almost had me for breakfast! It had romance! This is a family blog where the story of the bluebirds I saw isn't appropriate. But from those first rose kissed clouds to the sparkle of sunlight on dewdrops, it was a morning that filled me with a renewed reverence for all God's creation. A Sunday morning in God's house. It's a great place to start your day. 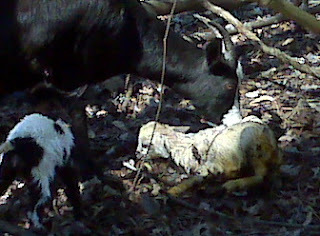 Three new fainting goat babies! And yes, even the tiny babies will sometimes faint. 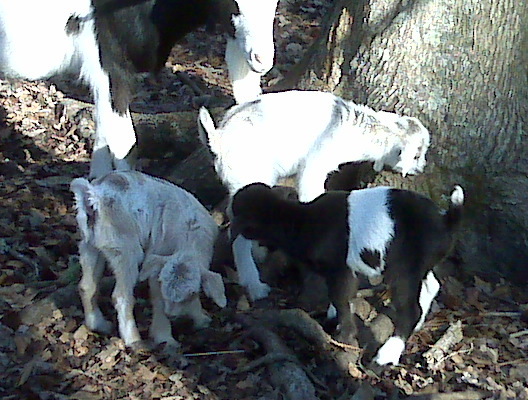 I'll leave them with their moms, but bottle feed these little guys some so that they'll be very tame and easy to handle.